G.Warner - Why was the "Bristol" Mercury so long lived? N.Stroud - Messerschpitts at five o'clock! 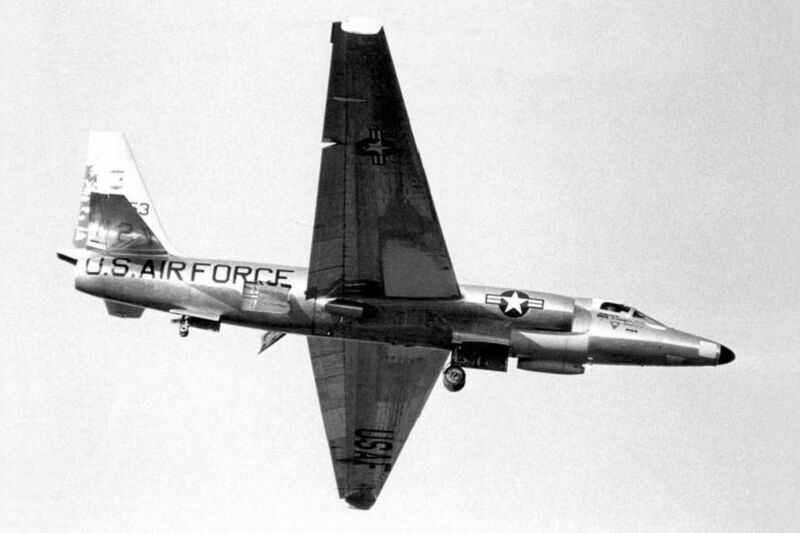 Lockheed WU-2A 56-6953 was one of the three specially-modified variants - note the scoop on the port underside of the forward fuselage - for high-altitude atmospheric sampling sent to the UK in the summer of 1962. Another rare photograph of WU-2A 56-6953, one of the aircraft used during Operation Bongo Drum, coming in to land. The 4028th’s CO, Col Leatherwood, was keen to stress the scientific nature of the unit’s work: “Our business is sampling the atmosphere. The aircraft are unarmed and have no photographic capability,” he explained to the press. Surprise, Surprise! 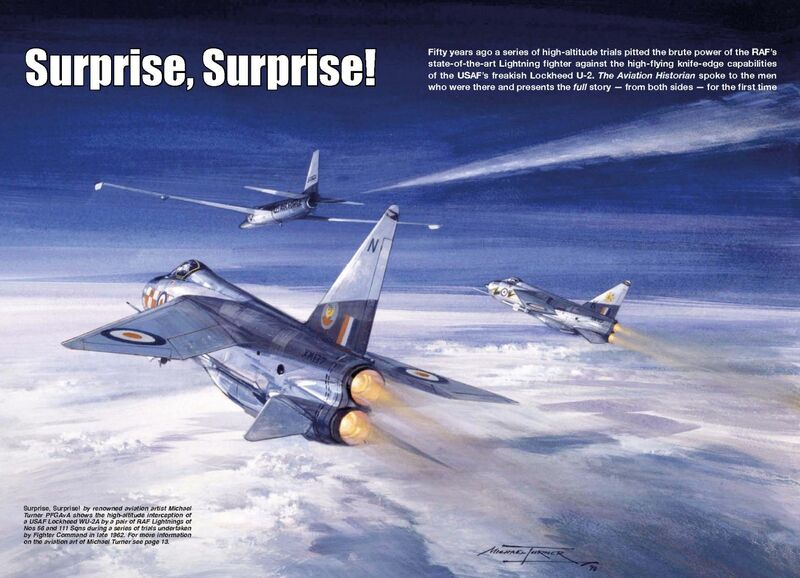 by renowned aviation artist Michael Turner PFGAvA shows the high-altitude interception of a USAF Lockheed WU-2A by a pair of RAF Lightnings of Nos 56 and 111 Sqns during a series of trials undertaken by Fighter Command in late 1962. 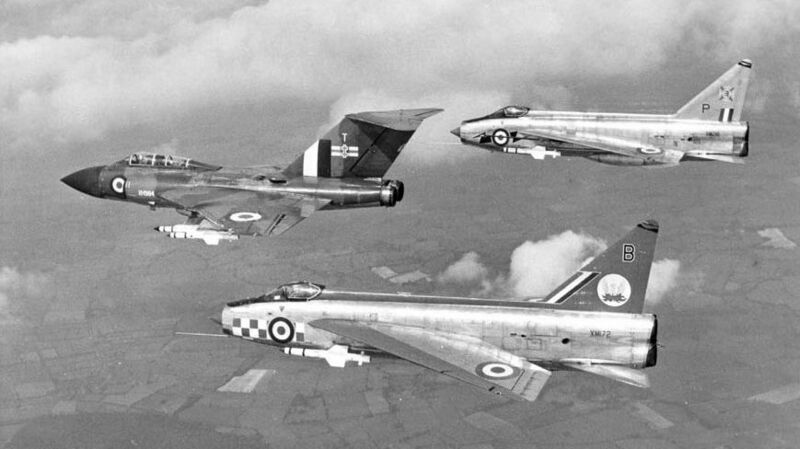 Britain’s interceptor force at the height of the Cold War comprised the Lightning, which continued to provide sterling service for the RAF well into the 1980s, and the all-weather Gloster Javelin, which had been withdrawn from front-line service by 1968. Here a pair of Lightnings of Nos 56 and 111 Sqns accompany a Javelin FAW.8 of No 41 Sqn. Lightning F.1A XM175/T was part of the first production batch of 48 F.1s and F.1As and joined No 56 Sqn at Wattisham in early 1961. The unit’s markings consisted of large red and white nose chequers thinly outlined in pale blue flanking the roundel and a small roundel containing the unit’s phoenix badge on the fin. The aircraft continued to operate with 56 Sqn until April 1973, when it was returned to BAC to serve as a test rig. 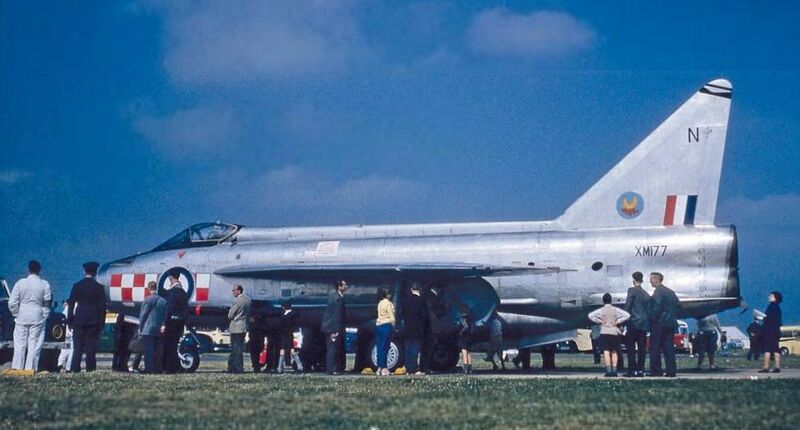 Seen here at RAF Wethersfield, Essex, in June 1961, XM177 of No 56 Sqn was one of the second pair of F.1As to participate in the second and final tranche of high-altitude trials, in November 1962. This aircraft later joined No 226 OCU and training flights at Wattisham and Leuchars before being struck off charge in March 1974. Lightning F.1A XM175/T comes in to land with airbrakes open during a sortie with No 56 Sqn. A total of four F.1As were used during the high-altitude U-2 interception trials in October/November 1962, two from No 111 Sqn and two from No 56 Sqn, XM175 being one of the latter.